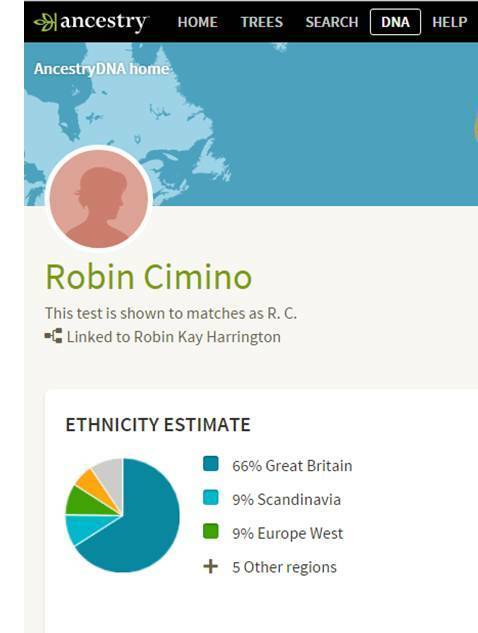 AncestorPuzzles.com: Robin's DNA- Scandinavian Surprise! Our biggest hope for Robin's DNA test was that it would confirm that she has Native American ancestry. The biggest surprise was there was not even a trace amount of Native American shown in her ethnic mix. 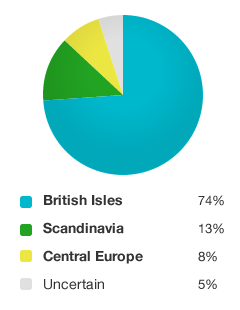 Other surprises were that the Irish ancestry was only 6% and Scandinavian was 9%. Now she is ready to go out and buy a Volvo! I loved this quote and comment in the blog post: “The people of this region are a real genetic cocktail,” says Oxford Professor Peter Donnelly. "So, if you hail from the British Isles, don’t be shaken if your genetic ethnicity results are decidedly stirred," adds Nick Cifuentes. John Nicholas Whisenant and Nancy Thompson are husband and wife but how is Robin connected to them? I searched our tree to find a Whisenant ancestor but could not find anyone with that name in our family tree. 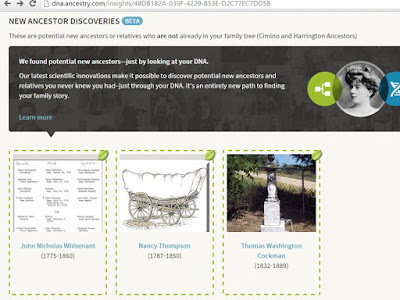 My old Personal Ancestral File (PAF) software has a feature that will search in the notes field of thousands of ancestors. The PAF search revealed that Robin's ancestor, Charles Thomas Pritchard was buried in the Whisenant Cemetery in Snowball, Searcy County, Arkansas. That seems like a good place to focus the search for the new ancestors discovered by the DNA test. We are now in the process of getting Robin's mom, Irma Fitzpatrick tested. Robin expected a little more Irish due to the Fitzpatrick ancestry. It will be interesting to see how much Irish shows up in Irma's ethnicity results. We are also encouraging all of our siblings and cousins to get tested. We are excited to find more pieces in our Ancestor Puzzles!